LiveCode LessonsLiveCode LessonsHow To - LiveCode Mobile Tasks LiveCode Mobile TasksHow do I use the Browser Control? This lesson describes how to build a simple web page navigator by embedding web browser control and Internet content on a mobile application. The application allows you to access web pages and display their content interactively. Sample code and screen captures are included. A web page navigator allows a user to explore pages on the Internet, using controls to manage the access to page content and using display areas to present web content to the user. This fundamental concept underlies many web page explorers and navigators, although their functionality is usually greatly expanded, compared to that being discussed in this lesson. Create the navigation buttons that allow you to move between the previous and next pages. We are using less than (<) and greater than (>) characters as the buttons labels. Create the stop and reload buttons that allow you to terminate a page load that is taking too long or reload a page that may have updated content. The letter X is used as a label for the button that stops the page load and @ is used as the label for the button that reloads the page. The URL (Uniform Resource Locator) field is a text entry window that allows you to specify the web page you would like to access. The previous steps showed you how to set up the controls that allow you to navigate or specify where you would like your browser to point to. This step sets up the controls that allow you to process the information that is returned from the Internet. First, create a display group with the name Browser. This browser window takes up most of the application area and is used to visualize the content that is downloaded from the Internet. Next, create a status field with the name Status that allows the application to display information on the loading process. This helps the user identify if he has to take actions to reload a page, terminate loading or wait a bit longer. Note: There is no code needed for these controls. We have now completed implementing the interface that may look something like the figure in this step. Now implement the code that ties the events from the buttons to actions that request page content and display the page content for the user to view. Note: The code samples that follow should all be placed on the single card of the stack. mobileControlSet sBrowserId, "rect", the rect of group "Browser"
put "Started loading:" && pUrl into field "Status"
put "Finished loading:" && pUrl into field "Status"
put pUrl into field "Url"
answer "Do you want to load:" && pUrl with "Yes" and "No"
put "Refused:" && pUrl into field "Status"
The URL text field and the button scripts pass information to the following two sections of code. These implement a layer of control that lies between the buttons and text field, and the LiveCode engine commands. This design simplifies the code as the local variable sBrowserId does not have to be visible outside of the card. Now that the interface and the code are complete, it is possible to launch the application on a mobile device and navigate the Internet. 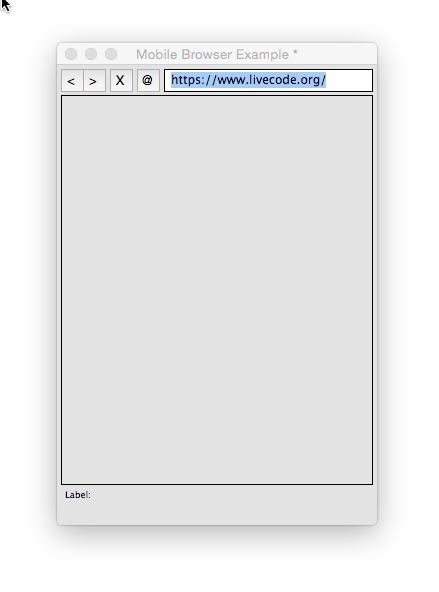 This example demonstrates what a web page may look like in a LiveCode application. Is better support planned for the future? no, we do not currently have clipboard support for mobile. It is on our list to be added, but we cannot provide a date for this yet. How do I load a html file from within the program (using engine). Is this possible? have a look at "mobileControlDo" and the action "load htmlText". This allows you to set the HTML that is to be displayed in the browser. Thankyou for directing me to this lesson. It has solved my problem!! Okay. Total noob here. I'm following along fine until I get to "create a display group." What is this and how is it done? Thanks for your help. I have been using this browser in an app for ios I'm building and the websites I load are very slow. In fact incredibly slow. Is there any situations you know of hat slows down the loading of URL 's or speeds up? Basically are there any traps for newbies? You can create a group by adding a control, perhaps a graphic to the stack and then grouping it using the Group button in the menubar. Then you can name the group "Browser" and follow through the steps from there. I'm not sure why the websites would be loading slowly. Could you email support@runrev.com, ideally with a sample stack or a full description of how you are creating the browser control and what site you are loading. 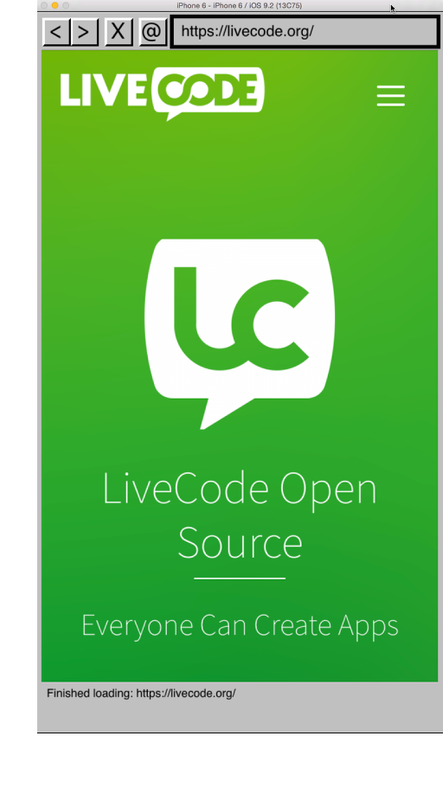 If you could also let us know what version of LiveCode, OS X, XCode and iOS SDK you are using and what device or simulator you are testing on we will look into it. Dont load the website first before putting into the mobile browser. load URL sMyUrl with message "myUrlBrowserDownloadFinished"
answer "Sorry, No Website is available for this property"
I'm glad you managed to sort it out, thanks for letting us know. I am wondering if it is possible to display other objects visually on top of the browser. I am trying to position a rectangle over the browser so that I can use it to capture the image inside of that rectangle. Every attempt I have made so far, the Browser seems to come to the front most layer and then every object I have tried is displayed behind it. Is there anyway to show a rectangle on top of the browser window? Is there a way to detect touch events that happen inside the rect of the browser? Is there any way to detect gestures that are happening in the browser window and "pass" them down the hierarchy to LC? For example can we disable gestures on the browser window and have custom code to respond to it? yes, you can add the appropriate event handler to the script of the control. In this case the rect of the browser. Try using the mouseUp handler or the mouseMove handler to track events. Hi Russell, yes that is the case now. Because of Apple's ATS requirement we have added a "Disable ATS" option in the Standalone Application Settings, if you want to use http URLs you can check that box. I have updated the sample stack and lesson to use an https URL instead. You should not have to choose the Browser inclusion if you are following this lesson as that is for the browser widget and this lesson uses a native mobile control, could you double check with the updated example stack? It is working fine now. Thanks.